ever wondered what lies behind closed doors ? that looks as if it hasn't been opened in a looo...ng time. I do now (wonder that is). Great photos. Your door reminds me of my favourite book as a child, The Secret Garden. So I'm imagining a wonderful garden behind it. I love these photos! What is it about weathered wood that's so appealing. Nice photos with a mystery. A beautiful Autumn Mosaic did you manage. Gorgeous colors convey a wonderful mood. Just fabulous...I do wonder and they beckon me to open them...stunning shots. Hello, I like the wood and the texture look with the greenery. Pretty mosaic! Have a happy week! Pity there were no little gaps to peep through. The colour of the wood is beautiful. Thanks to the charm of your photos, I definitely am curious about what is through the gate. A very interesting story can no doubt be told about the people who have lived within those faded character walls. It makes me wish I could explore! There has to be a story! The mystery about what is behind the door is better than knowing what actually is in there. Great fall colors with all that red ivy. Great photos and what lovely things I can imagine about the old doors and what is behind them. Wonderful photos and like Taken For Granted, I think the mystery about what is behind the door better than knowing what is actually the most fun of all!! Thanks for sharing!! I hope you have a great new week!! Intriguing and mysterious Dianne. Wouldn't it be fascinating to discover what lies beyond. There is something very photographically tempting about doors! Nice shots. A mystery! 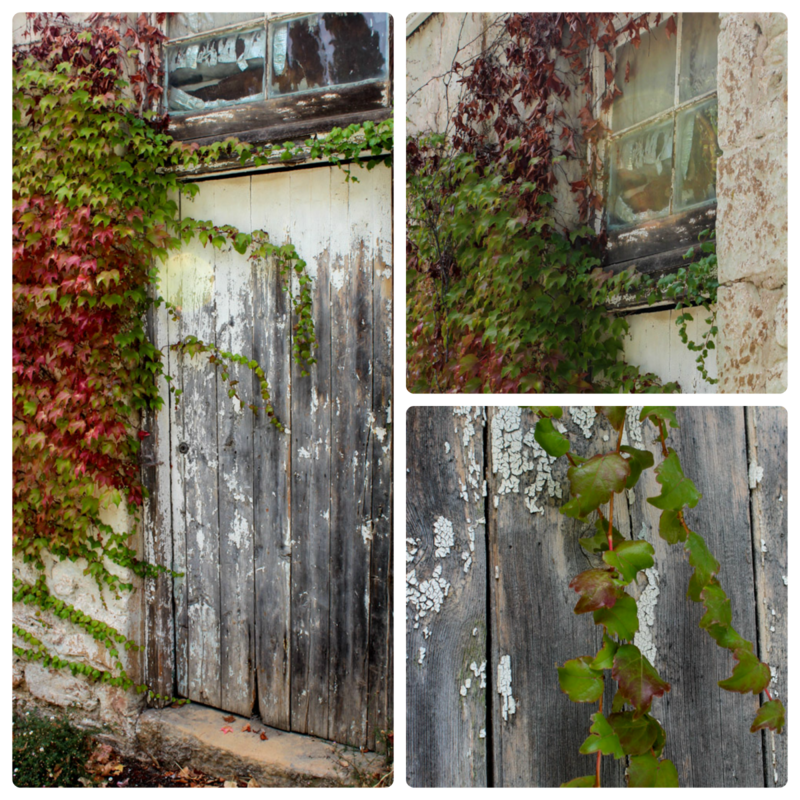 I love rustic things to photograph! Well worn door. I'm reminded of one at my cousin's farm. It is a big question....what is back there. All you need is one little peephole to catch a wee view. The fence though a bit rough looking is still a beauty. I get curious about gates like this that seem to be neglected, too. Lovely shots. These shots are wonderful! There's beauty in old weathered wood. I'd love to see what's on the other side but this side is intriguing too! I love these old cracked textures and the ivy growing over it all. It does make you wonder what is behind. I've been watching on TV the reports about the horrific fires north of Adelaide. I hope you are safe. Great textures! I wonder what is in there? I absolutely adore this mosaic!